“An icy, milky technicolour concoction”, said the late and great Anthony Bourdain, and he wasn’t too far off. Every Filipino knows and loves Halo-Halo, a beloved summertime dessert, but if you’re new to the Pinoy scene and feel like you’re missing out, just read on. Pronounced as ha-low ha-low, this treat is a mix-mix (that’s what Halo-Halo means!) of eclectic flavours, textures and colours so unique, it could only be Filipino. There’s so many variations of halo-halo that it’s hard to give a fixed definition, but it’s always a layered dessert with ice, evaporated milk. Beyond that, the ingredients are whatever smorgasboard of Filipino sweet treats the creator thinks goes well together. As you can see, it’s a fully-loaded dessert - almost a small meal by itself. It’s one of the few Mamasons desserts we don’t recommend eating straight after a big meal, in case you can’t finish it! But if you’re feeling peckish or just brave, there are few Filipino desserts more iconic than this. 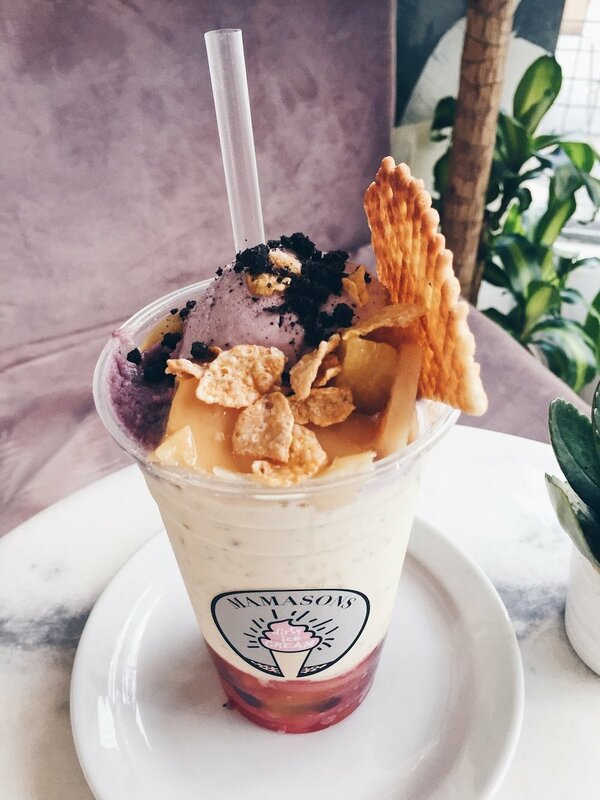 The amount of places you can find halo-halo in London can be counted on one hand, and that’s with us taking up two fingers! So you know you’re getting a rare dessert, and a pleasant surprise! When Anthony Bourdain first tried the halo-halo in Manila, he said “it makes no goddamn sense at all. I love it.” We made our version to make you want to say the same thing. The name Halo-Halo is Tagalog for mix-mix, and that’s exactly what you’re supposed to do with your cup! For an authentic experience, use your cup to mix all the layers together and drink it up with a straw. It might not look as pretty, but we promise it’s worth trying. Halo-Halo is available at both Mamasons Dirty Ice Cream branches.